Dri Archer drawing comparisons to Jamaal Charles? Published: June 11, 2014 at 08:01 p.m. 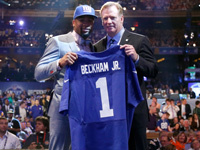 Updated: June 12, 2014 at 11:30 a.m.
With offseason practices in full swing, football fans from east to west are getting a first look at this year's class of rookies. Non-contact sessions don't tell us much, with running backs and shifty wideouts given the green light to flow through defenders untouched. What we can gather, though, are clues on how first-year players are being used schematically by their coaches. In his latest offseason video notebook, NFL Media's Albert Breer stressed that a primary focus in Pittsburgh is improving a ground game that finished 27th in the league last season. While free-agent addition LeGarrette Blount has "impressed" coaches and figures to form a one-two punch with second-year back Le'Veon Bell, one young X-factor looms: Dri Archer. The runner out of Kent State "has been tagged internally as a miniature version of Jamaal Charles" in Todd Haley's offense, per Breer. It's also worth nothing that Steelers general manager Kevin Colbert previously drew a parallel between Archer and former Lions return man Mel Gray, another hint that Pittsburgh has big plans for the 5-foot-8 jitterbug. The Cardinals third-round pick from Pittsburg State has drawn "favorable" comparisons out of the slot to Colts burner T.Y. Hilton, Breer reported. Brown was "blowing everyone away" last month at rookie camp and the team remains impressed with his route-running and 4.34 speed -- identical to Hilton's, who thrived under coach Bruce Arians in Indy. With the Browns taking a conservative approach to Ben Tate's practice activity, rookie running back Terrance West "has been getting reps with the first team," The Plain Dealer noted Wednesday. The newspaper also tabbed West for a "major role" this season, while NFL Media analyst Charley Casserly believes the rookie could wind up starting in Cleveland. Another rookie to keep an eye on in this crowded backfield? Former five-star recruit Isaiah Crowell. Want a sneaky pick for Defensive Rookie of the Year? How about Jets safety Calvin Pryor, who instantly endeared himself to Gang Green faithful by announcing his hatred for the Patriots and Giants. He's backed up his talk in practice, with ESPN.com's Louis Riddick hearing the hammer-dropping run-stuffer has been "special."